Sundarban Courier Service (Pvt.) Ltd Job Circular 2019 has been published by their authority in daily online job portal and to get from the best jobs and the education portal website in BD Jobs Careers- www.bdjobscareers.com. For the user understanding, we would like to inform you that,It’s a large group of company in Bangladesh. They offered various job position on their official website. We collected the jobs circular from their live website. Sundarban Courier Service (Pvt.) Ltd offered various job position in the circular. Also offered attractive salary range, various festive bonus and others benefit. 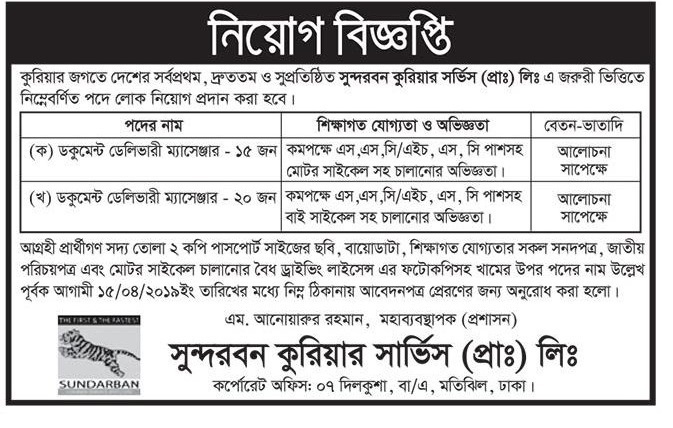 So check now sundarban courier service jobs circular 2019.